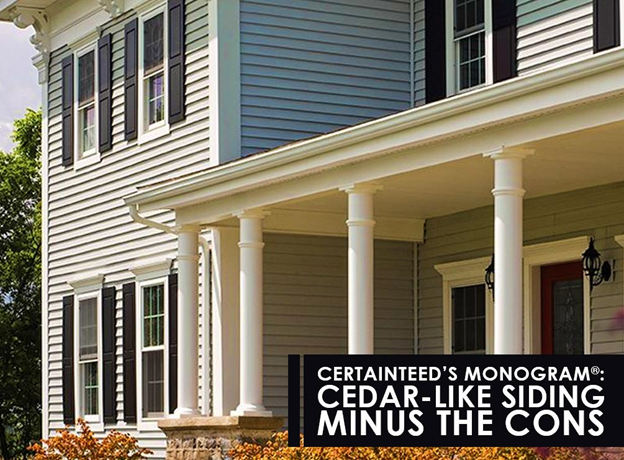 CertainTeed’s Monogram® vinyl siding lends the authentic look of cedar without its steep cost and demanding upkeep. Of all the horizontal siding solutions on the market, the Monogram creates a balance among design versatility, weather resistance, and ease of installation. Vinyl is popular for its versatility in design, but Monogram takes it to a whole new level. As a matter of fact, it comes in the largest array of color selection. It gives you the unique opportunity to as be creative as you want when it comes to visualizing your home exterior’s appearance. Monogram siding in Connecticut is available in 23 low-gloss solid hues and seven wood-tone color blends, offering you the unmistakable charm of genuine stained or painted cedar. Furthermore, you can choose from three classic styles to give your home the stunning look that it deserves. The best part is that it’s nearly maintenance-free, so you can expect its rich color to stay rich for a very long period. Using CertainTeed’s RigidForm™ 220 Technology, your Monogram siding system would remain in one piece under wind pressures of up to 220 mph. Constructed in heavy-duty .046-inch thickness, you can rest assured that your siding panels would put up a great fight with Mother Nature. Also, Monogram vinyl siding in CT has an incredible Class 1(A) fire rating. In other words, this siding solution discourages the spread of fire to help protect your home and your family. Any experienced siding contractor would agree that Monogram is one of the easiest systems to install. Although you may not experience the ease personally, expediting your siding installation minimizes your home’s exposure to the elements during construction. CertainTeed’s Patented STUDfinder™ design makes Monogram panels promote secure and accurate installation to ensure quality and reduce the amount of disruption caused by your project. Find out if Monogram siding is right for your home. Call Vinylume now at (866) 244-8029 and schedule your free in-home consultation.